So I've gotten my Divine (f)Ire Witch about where I want her. Respec'd out of Elementalist and into Occultist because the damage was about the same, but Occ works much better for CI. Overall it's turning out great, and by the time I get a 6 link, a Flammability Impresence, and -Mana reservered Zealotry enchant, I should be loosing DI's for 1.3m DPS with 7-8k ES. The only problem is how ridiculously expensive CI gear is. 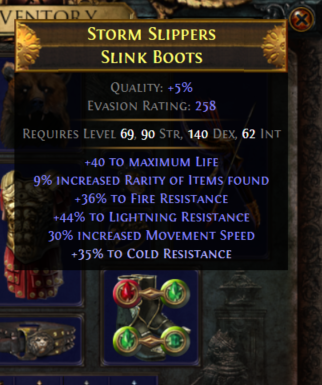 150ES boots with 20% movement speed and nothing else? Easily 50 chaos. 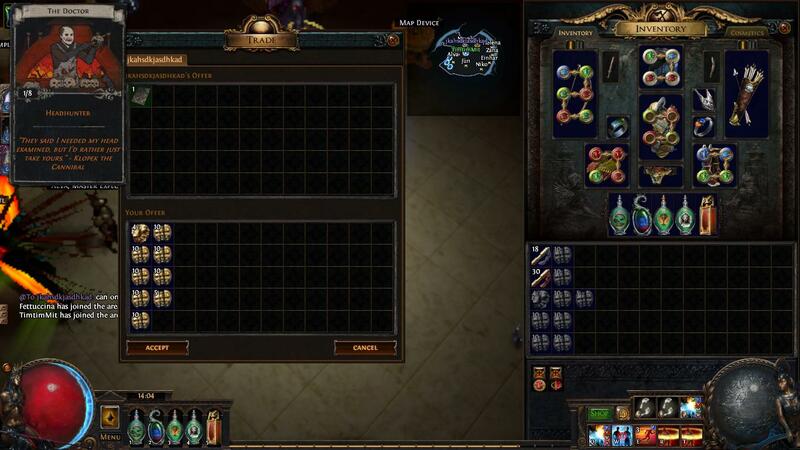 I got super lucky though and picked up a 550ES chest piece for ~8c, dumped 300 jewelers and 7 fusings to get it to a 5 link. 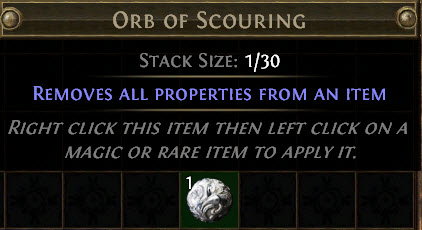 How bad of an idea is it spend an exalt on nothing but maps? Everything on PoE trade is either barely an upgrade for me or 2.5ex+. Yeah it's pretty much back to soulrend trickster main for me. Take all of my money. 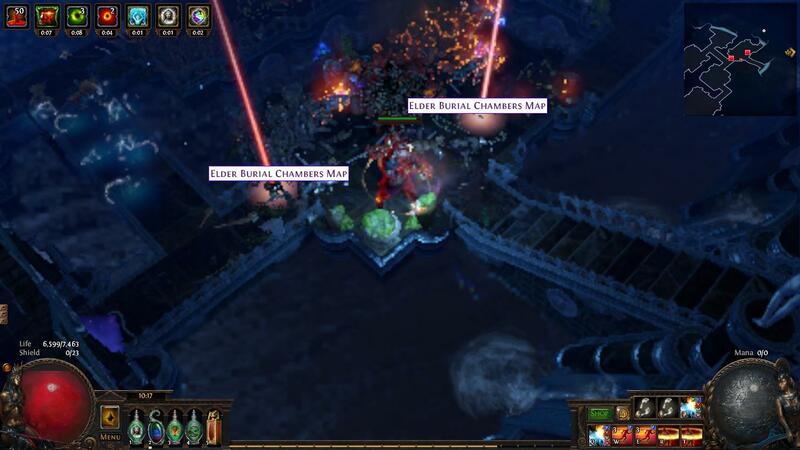 If someone had 1ex and only had 5 tier 3 maps to their name, and had absolutely no idea what they were doing, what would you recommend? Asking for a friend. You could invest in some shrieking essences of zeal; once people are able to fossil and essence craft fractured items, those should go up in price some with people trying to make Onslaught boots. I'm starting to thin that picking this league to finally try a CI build was an expensive idea, and maybe I'd be better off going with something else... but the issue is I'm already in Act 7, and I really don't want to have to start all over with the little amount of time I have to play each day. ES gear is balls expensive this league, it's true. But if you're only in act 7, you ought to be able to pivot to a life-based build without too much trouble. What are you leveling as, ascendency wise? I mapped for quite a while with 3800 ES on my trickster with some real garbage items and It honestly wasn't bad. I think if you look for the best 1c items you can for each slot when you get to maps you might be surprised how much ES you end up with. DI Trickster is what I'm doing and it totally works as a Life build.  Here is my profile; the character is RiusFirinALazor. My helm and chest armour are really crappy because they're ultimately getting replaced with a Devouring Diadem and The Perfect Form. Equivalents of all the rest of my gear ought not to be too expensive. I haven't decided if I'm going to sneak in more uniques here and there, I'm mostly just continuing to fill in my yellow maps. I will probably pick up an Atziri's Step at some point to push my spell dodge to 66%. Once I have Diadem+TPF I'll be able to run Zealotry + Wrath + Herald of Purity + Purity of Ice + Arctic Armour, all out of my mana. I have ~4.8k life right now and ~1600 ES, the latter of which protects my Mana via EB, and I'm using MoM. I've got the health potion for when my Life gets chunked, and once I have Diadem I'll slot in Desecrate + Spell Cascade into my CwDT setup in my gloves; this'll ensure there will always be 10+ corpses around for the Devouring part of the Diadem, giving me back 4000 Life + ES every 5 seconds. Also don't take my passive tree as gospel, I haven't really optimized the Shadow starting area and I'm likely to ditch the shield cluster and definitely going to ditch pathing to EB once I get a Diadem. EB lets you reserve all your mana but still use ES to cast, right? Does Clarity regen your ES if you have EB? Yes to your first question, no to your second. They changed EB last league to still allow your natural ES recharge to kick in even if you've lost ES recently due to casting costs, which is what helped make EB good again. I basically never run out of ES, though. My channeling costs are so low thanks to Lucidity, plus the chunks of ES gained due to ghost shrouds when hit. This is where I'm at so far, so I don't know that swapping things around would be too expensive/difficult. Yeah, you're already adjacent to or close to most of the Life nodes you'd want to pick up. Trim some of the extra unnecessary passives away (the AoE nodes in Witch, all the ES stuff of course, etc) and path through the Templar area like I have done, and you'll be fine. 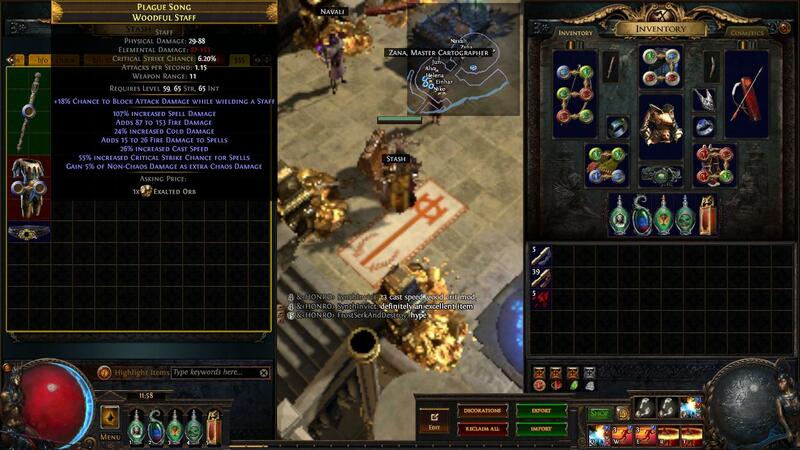 So this is the first league that im needing this item. Any recommendations on how to farm a Shavronne's wrappings? I have a whopping 8 chaos to my name right now. I've only been doing white maps so far, but it's absolutely wrecking everything. I'm currently trying to balance Blood Rage, Dread Banner, Ice Golem, and Assassins Mark because all of them provide a huge bonus but with a glass-cannony build like this it's difficult to keep all of them up at all times. Prices are going up too. I bought this for 8ex in week 1 and now it would be like twice that. I've been looking at buying shields and it's over 15ex for a 500 ES shield. I haven't been looking at Watcher's Eyes yet, but running the auras I'm planning on running ought to enable me to get a decent one. I'm thinking Immune to Freeze with Purity of Ice and some sort of useful Zealotry or Wrath mod? Looks like there are a few right now from 50c-3ex. Nothing absurd like lightning pen or crit chance, but useful stuff all the same. I hate getting Frozen. Or 3ex could get me Phys -> Lightning conversion and Arcane Surge mods, which combined with Phys -> Lightning craft on gloves would free up a support gem. Plenty of options. So...why exactly would i want to run CI AND a Shavronnes wrappings? sigh.. the guide im following is confusing to me. it got four different PoB instructions, options for Shav or CI mixed together and the instructions talk about the various different options in the same sentence with each other. If I'm going to guess that with Shav's and Pain Attenuation it's a low-life build, one that keeps you permanently damaged to a "low life" state, that may go through a CI portion until you can get Shavronne's to maintain it without dying. The CI version is using Skin of the Lords instead. Low-life builds are fairly difficult to maintain if you're not used to them. 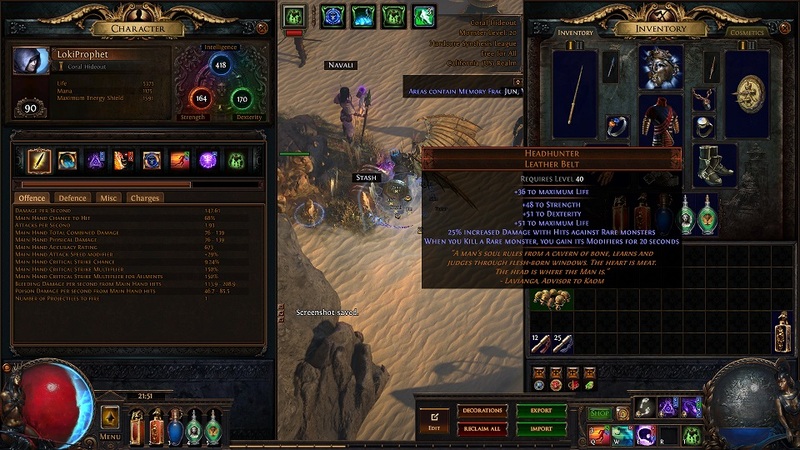 You can level as life or hybrid life/ES, then flick the CI switch once you've got enough ES gear, then convert to low-life once you can afford a Shav's plus the costs of linking it. That's probably why the guide has recommendations for all the options. You would never mix CI and Shavs though. Going with Oskarms instead of Haem. No-effort power charge generation freeing up a few slots, stick my golem on CWDT, and all I'll have to worry about is Dread Banner and Blood Rage as mechanics. Make up the bleed chance in jewels. Boom. Edit: Or keep haems, get a ring with it on there, keep goresplosions intact. I have about 25c worth of CI gear you can have. I can't stand selling things in this game. Friend me at LamentationOfTheFlames. I've been playing since day 1 of the paid beta. It's over. I won. 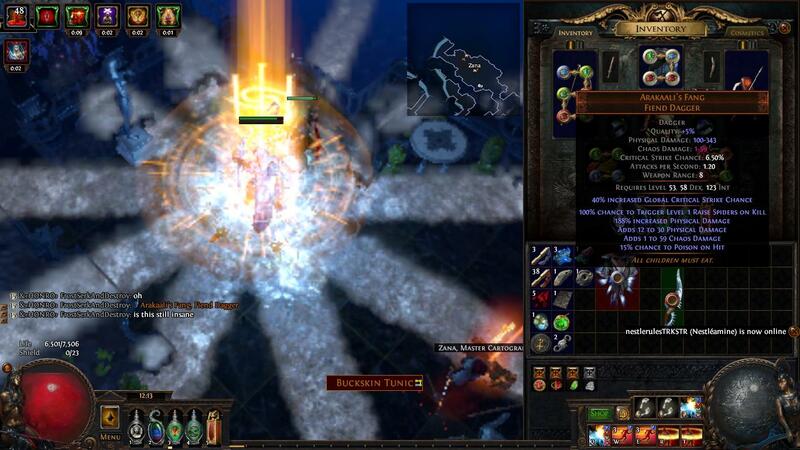 I beat Path of Exile. You can all go home. hopefully joining you soon in HH town @AresProphet !!! and found an arakalis! too bad theyre down to 60c, someone needs to make an uber elder kill video again to drive up the prices! I just found out the hard way that, if I swap over to Yugul and use an Orb of Regret to spec out of Avatar of Fire, I can do elemental reflect maps very, very slowly. Unfortunately I had already thrown four chisels at it and ran it. I guess I glossed over the 'this map will instantly murder you' modifier. Really hoping they fix Betrayal content, the lag spikes are ridiculous and mostly unavoidable. I was also getting a bug where trying to cast spells while near monsters instead caused me to walk to wherever I clicked (killing me four times and wasting a 20% tier 7 map, thanks). It also seemed to lock me into the action, so I could cancel walking into the mob packs even if I saw it coming; strangely enough as long as I wasn't near a monster everything worked fine. If you scour a map with chisels it keeps its chisels in case you didnt know.